By using commercial wood pulp, white shavings, rice straw, wheat straw and bagasse as raw materials, paper producers can make high quality household paper like toilet paper, tissue paper, napkin paper, facial paper, kitchen towel paper, etc. 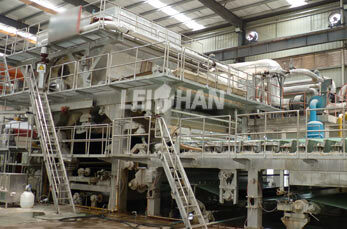 Leizhan delivers the whole household paper production system for waste paper recycling line. It contains: household paper stock preparation system and household paper making system. Leizhan Household paper making system contains the following components: wire part, headbox, dryer cylinder, turning roll, touch roll, rack, gas hood, cleaning roller, wite leading roll, expander roll, electric tensioner, reeling machine, suction felt box, spray pipe, pneumatic corrector, etc.